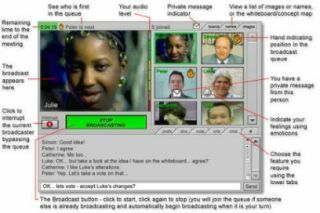 The Flashmeeting Project (http://fm.ea-tel.eu/), based on the Adobe Flash ’plug in’ and Flash Media Server, allows anyone from anywhere in the world with an internet connection to meet online. A meeting is pre-booked by a registered user who passes the url that contains a unique password for the meeting to the people who wish to participate at the arranged time. Not only is there shared video and audio, there is a public and private chat room, shared whiteboard and even shared concept map. During the meeting one person speaks (i.e. broadcasts) at a time. Other people can simultaneously contribute using chat, the whiteboard, or emoticons etc. while waiting for their turn to speak.They can present using audio only or video and audio. A replay of the meeting is instantly available, to those with the ’unique’ replay url. You can make your meetings available to Folksonomy (public) or to those that have the unique replay url. 1. Sign In: Either enter FM using your ’Sign In’ email and password, or simply leave them blank and enter as a ’Guest’ (with reduced features). 2. Check Video and Audio: If your camera and microphone do not work here, they won’t work in the meeting. You can open the test application to check them. 3. Enter Screen Name: Enter a screen name, click the terms box (click ’terms’ to read them if you wish) and click ’ENTER’. 4. Start Broadcasting: Click ’START BROADCASTING’ to let people see and hear you. ONLY ONE PERSON at a time can broadcast in FM! 5. Stop Broadcasting: Click ’STOP BROADCASTING’ to end your broadcast. 6. Join Queue: If someone is already broadcasting, click ’JOIN QUEUE’ and you will begin broadcasting automatically when it is your turn. No download and installation - it works in a web browser with Flash 8 (or greater) ’plugin’. Shared concept map available to share concept/knowledge maps etc. Vote and ’Emoticon’ options - share your opinions and feelings! The Flashmeeting Project was designed for research to give insights into how live videoconferencing can be used in novel ways, supporting online communities and creating new reusable learning objects. FM has been used over four years by a great variety of communities of learners and knowledge workers across the globe. Theresearch investigates how FM is used to foster online communities, how to search and browse FM replays and use them as objects to learn and a number of other themes. You may find that you need to start a new theme such as Professional Learning Communities.